Shandong University is sitting in an interesting position. Part of its development includes a new Biodesign Center, the result of a collaboration with Arizona State University. It is part of ASU’s continued effort to deepen and expand research and related initiatives across China. Earlier this week, representatives from SDU visited Tempe to meet with school officials on future collaboration and to see ASU’s Biodesign Institute, where researchers work to develop commercially viable health care, sustainability and security solutions by studying how the natural world is designed and how it functions. SDU is using Crow’s New American University model to help it become one of China’s educational leaders. It is focusing on such broad-ranging topics as building a state-of-the-art academic innovation hub, fusing research disciplines using ASU’s use-inspired research approach and fostering STEM education. As one of China’s leading materials scientists, SDU President Rong Zhang was fascinated by the Biodesign Institute’s next-generation sensor and biomarker array technologies. 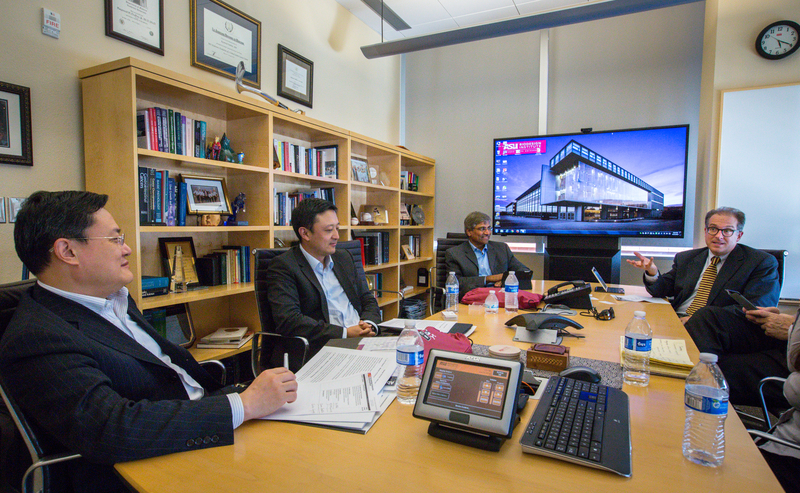 Zhang, along with SDU's Director of International Affairs Nan Zou, met with President Crow; Dr. Sethuraman “Panch” Panchanathan, senior vice president at ASU’s Office of Knowledge Enterprise Development (OKED); and other ASU officials, to discuss potential opportunities for research collaboration in areas such as materials science, DNA nanotechnology, biomarker development, bioremediation and sustainability. Technology transfer has risen to prominence over the past three decades in China, and the Chinese government has adopted numerous policies to encourage international technology transfer, recently shifting its focus toward promoting U.S.-China advanced tech-transfer projects in new energy, new materials and sustainability. President Zhang expressed strong interest in building a platform where transdisciplinary and collaborative research can be done across the two countries. At the Biodesign’s Center for Biosensors and Bioelectronics, Zhang met with the research team that created Breezing, the world’s first portable device that can track an individual’s metabolism. Executive director Raymond DuBois outlined Biodesign’s broad goals of expanding its research portfolio and global partnerships, and pointed out such recent successes such as the formation of a new ASU-Banner Neurodegenerative Disease Research Center and biomarker development as opportunities where collaboration could have a broad impact on early disease diagnostics. One of ASU’s leading nanotechnology scientists, Hao Yan, who directs Biodesign’s Center for Molecular Design and Biomimetics, is an alumnus and guest professor at SDU. Yan also joined the discussion to welcome President Zhang’s delegation and introduced his research projects at ASU to outline future directions and areas where faculty exchange programs and extending Biodesign’s research porfolio could broaden and strengthen ASU’s global partnerships with China. Written by Jennifer Zhou and Joe Caspermeyer. The team will study information cascades – trends marked by people ignoring their own knowledge in favor of suggestions from others' actions – as they relate to terrorist networks' social-media posts, including the power of images online. Earlier this week a United Nations panel asked social-media companies such as Twitter and Facebook to respond to how terrorist groups use their networks to spread propaganda or recruit members with increasing success. ASU is leading a group project that has been awarded a Minerva grant to study of what types of information go viral online, and what types of actions or responses can halt the spread of viral information. The Minerva Initiative is a Department of Defense-sponsored, university-based social-science research initiative launched by the secretary of Defense in 2008. It focuses on areas of strategic importance to U.S. national security. This grant will allow the team, which includes people from the U.S. Military Academy and Britain’s University of Exeter, to study information cascades – trends marked by people ignoring their own knowledge or information in favor of suggestions from other people’s actions – as they relate to the social-media posts of terrorist networks. “The first phase of the project is we are trying to understand what goes viral. The viral (message) is driven by two things: what type of content and what type of network. The right content and the right types of networks are going to resonate and spread and maybe gain new followers,” said Hasan Davulcu, the project’s principal investigator, and an associate professor in ASU’s Ira A. Fulton School of Engineering and director of ASU’s Cognitive Information Processing Systems Lab. Once they understand the information cascade, Davulcu said they might be able to determine how to counter the viral messages. But, he clarifies, this study will not include developing content to thwart online terrorism. Rather, the team will be observing what organic information created by social-media users tends to halt terrorists’ viral content. “It’s the early detection of what works for them and what works for others opposing them,” Davulcu said. The team believes images and videos might be some of the more persuasive ways to create partisan passion. 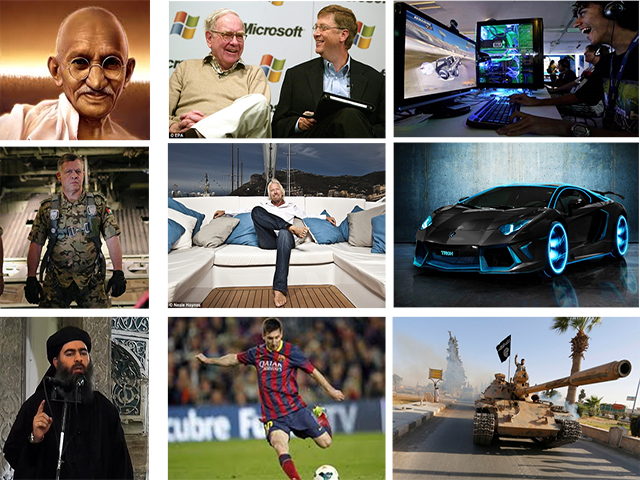 These images could be pictures of enemies or adversaries; a photo of Ghandi to illustrate peace; or something as common as a sports star, suggesting action. Studying the use and relationships of these images could provide a lens into the diffusion of various ideologies. Shakarian understands the issue of terrorism from another perspective, as a former member of the U.S. Army who served two years in Iraq. “The idea is that if we can understand which of the postings and messages of ISIS have the potential to go viral then we can learn to combat that much better than we do now,” he said. ASU’s Minerva grant is situated in its Center for the Study of Religion and Conflict, which incubates new research into the complex role of religion in human affairs. Mark Woodward, associate professor in ASU’s School of Historical, Philosophical and Religious Studies, and Baoxin Li, associate professor of ASU’s School of Computing, Informatics and Decision Systems, are also part of the Minerva team. This is ASU’s second Minerva grant. The first was awarded in 2009 to study how to strengthen the voices of the Muslim majority who didn’t condone violence. Davulcu and Woodward were a part of that project, as well. If this second one goes well, there could be more in the future. “The transdisciplinary environment of ASU has really enabled us to bring together faculty in innovative ways,” said Linell Cady, director of the Center for the Study of Religion and Confict.